Cayuga, Seneca and Tompkins counties are working with a Steering Committee of local and state agencies to develop a Blueway Trail Plan for Cayuga Lake. Funded through a grant from the NY Department of State, the Blueway Trail Plan Committee hired Alta Planning + Design with Ithaca-based landscape architect Rick Manning to guide the development of the plan. A highlight of the nine-month planning effort is a two-day Blueway Trail planning workshop scheduled for April 24 and 25 in Ithaca and Cayuga Village, respectively. Details of the event are outlined below! 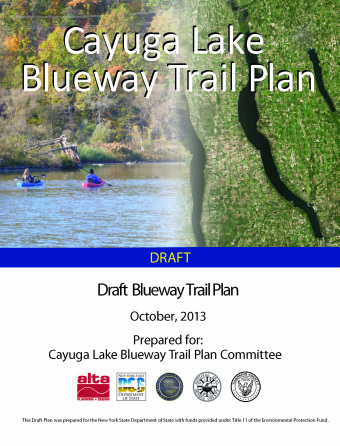 The Draft Cayuga Lake Blueway Trails Plan has been uploaded to the website under "Documents and Maps". Comments regarding the plan can be submitted through the website under "Public Involvement". Thomas Knipe, tknipe@tompkins-co.org, Tompkins County Senior Planner.